My Grandmother Sophie Morganroth always taught me that there is a time and a place to do things. Sometimes I take her comments to different extremes. 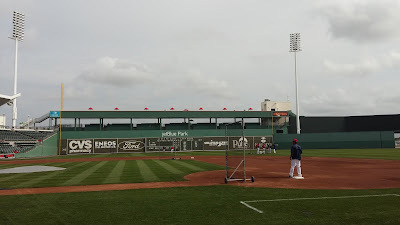 But during Spring Training, along with My Photographer Candice Ebling, we spent Easter Sunday covering the Boston Red Sox vs Philadelphia Phillies at jetBlue Park (also known as Fenway Park South) in Fort Myers. Spring Training is a great opportunity to write feature stories because of the relaxed environment. Since I've been covering baseball dating back to the 1981 Baseball Winter Meetings at the Diplomat Hotel in Hollywood, FL., attending Spring Training is My Favorite Time to cover sports. I've enjoyed catching up with players, managers and trainers who launched their careers in minor league baseball. I've also established friendships while covering the Detroit Tigers. When I returned to live in Florida in 2002, I was eager to cover Grapefruit League Games. During this time, I've been able to cross paths with former Fort Lauderdale Yankees Pitcher Chuck Hernandez, who was once a pitching coach for the Tigers. In all my years of covering baseball, the left-handed Hernandez had the best pick-off move I've ever seen to first-base. Detroit's Head Trainer and Mastermind Kevin Rand always finds a way to keep the Tigers competitive especially with the team's recent rash of injuries the past couple of seasons. We've talked many times since my return to Florida. It's always great to see former Tigers Manager Jim Leyland every year. Another great friend that I've known since the 1980's is former Tigers and current Milwaukee Brewers Hitting Coach Darnell Coles. Former Tigers third baseman Dean Palmer and I worked together when I was the Director of Public Relations for the Gastonia, NC Rangers (Texas Rangers Class A) in 1987. 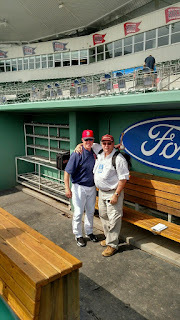 But one of My All-Time Favorites is Boston Red Sox Third Base Coach Brian Butterfield. We had a championship season together in 1982 and during the campaign we talked together a lot in the clubhouse. During this year's post-season, you'll probably hear his name from time to time by the broadcasters on whether he decides to hold a runner at third base or wave him home. Even though I could have written this story during the regular season, I decided to do it later because I felt confident that Boston would reach the playoffs, thus this would create more interest. There are times which my timing for posting stories can be questioned, but for the most part, I do my best to make things work and more timely. On March 27, 2016, Easter Sunday, the Red Sox hosted the Phillies. It was a great opportunity to see Red Sox legend David "Big Papi" Ortiz enjoy his last couple days as a Boston player at his Spring Training Home in Fort Myers at an awesome ballpark. But more importantly, the highlight of this day was spending time with a championship buddy. Butterfield and I had a great conversation reminiscing about the past and his career. I hope you enjoy this exclusive interview with a guy who was the first third-base coach in Arizona Diamondbacks History under Buck Showalter from 1998-2000. The 58-year old Butterfield has also been a managerial candidate for the Toronto Blue Jays and Red Sox. Q: Brian, you and I go back a long ways dating back to our 1982 Florida State League Championship while I was a sports writer for the Hallandale Digest. Tell me what it was like to experience that feeling with the Fort Lauderdale Yankees? A: Anytime you win a championship, it doesn't matter what level it's at, whether it's high school, college, legion and little league. That was a very memorable season with a bunch of great guys, great people around the team, and it's a championship I'll never forget. Q: What were your thoughts about Fort Lauderdale Stadium? A: It was fantastic. You have the backfields to work on that were always in good shape. It was a real nice main field, good cages, and a nice clubhouse. So it was nice living in the Florida State League even though it was Class A Ball. Q: There is Class A Ball and Advanced Class A Ball. I've always told people not to underestimate this level especially because of the logistics and dimensions of the park. I've also mentioned to people that due to the fact that many of these venues were made for Spring Training, the statistics are accurate. Would you agree? A: That's a great point. The Florida State League has always been considered one of the absolutely toughest Class A Ball Leagues. It was an honor to play there with such a great organization (New York Yankees). Q: Tell me how your career has progressed since our days in the Florida State League? A: To make a long story short, this is my 20th year in the Big Leagues. I've been blessed to be with good organizations. I was out in Arizona with the Diamondbacks for a while. I've been with the Yankees for a long time as a manager in the minor leagues as well as a coach. I got a chance to coach in the Big Leagues with the Yankees. I moved on to the Toronto with the Blue Jays, came over to Boston from Toronto where I spent 12 years. Now I'm a member of the Boston Red Sox, and this is my fourth year here. I was blessed to be a part of that 2013 World Championship. Q: John Farrell was manager in Toronto. Did you follow him to Boston? A: Yes, yes. I went through several managers in Toronto. It started with Carlos Tosca. It went from Carlos to John Gibbons, to Cito Gaston and then to John. I was also able to play under some outstanding managers. Q: What was the 2013 World Championship like in Boston? By then there were no curses to deal with. A: I have "The Ring" put away. It was special and a great group of people. We had a veteran core of players that played the game with great respect and, I had one thought, one night, that we were trying to win ballgames. We did a great job, stayed healthy, and everybody did a fantastic job. Once we got in the playoffs, and the World Series, the players took it to another level, and it was even better. That was a memorable World Series Championship I've ever been a part of. It will be something that I will cherish forever. Q: You have a lot of interesting characters on the Red Sox including Ortiz. What's it like to be around these guys? A: It's hard to pick out a select few that I enjoy being around the most. Dustin Pedroia is a guy that as soon as we came here, he bought into everything we did, and he's an easy guy to coach because he does everything right. He buys into the program. He's been a great leader for us. There have been so many good guys. We have a great group here. They're young but have high character players. The organization has done a great job in the way they draft players and bring them along. Guys like Mookie Betts, Xander Bogaerts, Blake Swihart, Christian Vazquez and the list goes on and on. But it's a good group to be around and we're going to do this thing together. 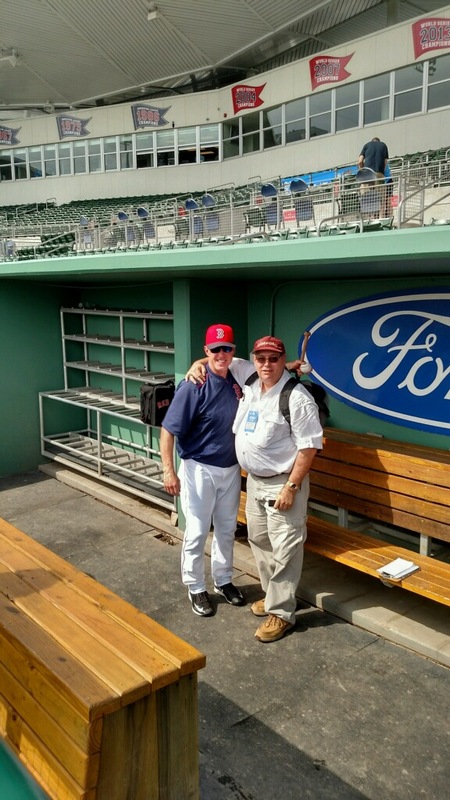 Q: What's it like to coach in an iconic historical place like Fenway Park especially since it's hitter friendly? A: It's a dream come true for me since I grew up in Maine. Our current home is a two hour drive from Fenway. We're right down the southern tip of Maine. I grew up a Red Sox fan, dreamed of playing for the Boston Red Sox. But I'm doing second best as coach of the Red Sox. It's a great, great place to play. The passion of the fans in New England are second to none. It's a great opportunity for my family and my grand kids. They had a chance to come on the field when we won the World Championship in 2013. That's something I'll remember seeing those little people running on the field celebrating with us. Q: Growing up in the Yankees system and being part of the Red Sox food chain now, if anyone knew this rivalry well, it has to be you. Do you agree? A: You understand it as good as anybody, but think about it, growing up as a Red Sox fan, there is nothing but the Boston Red Sox. As soon as you become a New York Yankee, you learn to hate the Red Sox. I did it for a stint as a minor leaguer in the Yankees organization. As soon as I got out of the Yankees organization, I quickly became entranced by this organization. I'm very happy and very blessed to be back with the Red Sox. Q: Unlike any of the other four major sports, with baseball, there is Spring Training playing 30 games, in addition to a 162 game season. If a team's fortunate enough, there is a wild card elimination game plus three full tiers culminating with the World Series. I've always believed that injuries play a larger role than most people think. Also, it seems as though there is a lot more luck involved to win a championship. What are your thoughts? A: I agree. One of the most important things with a Major League Team is depth. You better have a lot of depth because injuries will occur during the season. Players may need rest. We may have an advantage going in because we are deep position players wise. We're deep with arms and we might be able to hold down the fort for awhile if guys go down. Q: I will say one thing about the Red Sox is that ownership has a big checkbook and isn't afraid to spend as evidenced by the signing of former Tigers Pitcher David Price. Isn't it easier to have access to unlimited resources? A: They've done a great job. There is great people in the front office. We've been so impressed with the work of Dave Dombrowski. He knows the game, is a great baseball man, but he's a great person who is so respectful to everybody that works for him. It's an honor to work for him. He is so respectful to this great game. Q: How would you describe what the Boston Red Sox fan base is like? A: That's one of the biggest thrills. There is nobody in the country that's as passionate than the people of New England. The demands are great and the demands we put on ourselves are great. We kind of look at it as bring it on, and we want to do well for our fans, as well as our franchise. We're met with challenges everyday, and that's the way it should be. 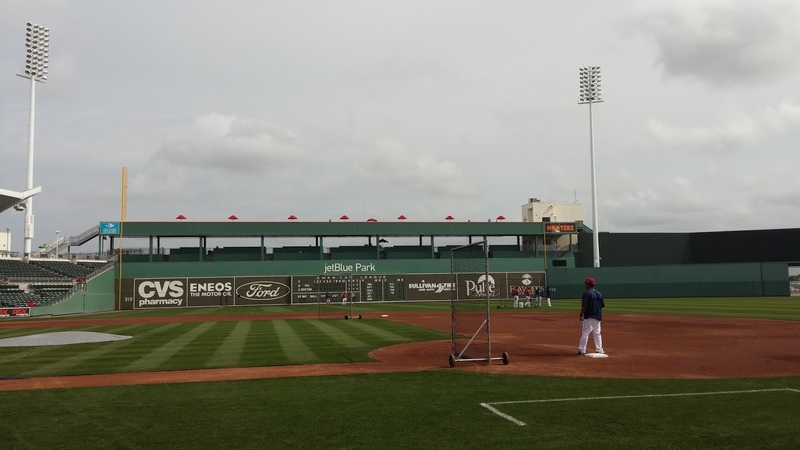 Q: What do you think of jetBlue Park? This is my first time being here. To me it's "Jet Jewell Park" because it resembles Fenway, which is on my bucket list before I die. A: That's a great name for it Scott. I echo your sentiments. It gives us an ideally great look at what we're going to be playing 81 home games. It gives our guys a chance to see our dimensions. It's a great idea by the Red Sox, plus there is a great fan base in Fort Myers. We travel well and our fans follow us all over the country. Not only during the regular season but during Spring Training. Q: I recently visited Chain of Lakes Park, the former Spring Home of the Red Sox in Winter Haven. I know you played there with the Fort Lauderdale Yankees. What are your thoughts of the place? A: I went there again and there was the mystique of the Boston Red Sox organization. I was always interested growing up and watching the Red Sox on TV. Even though I was wearing another uniform of the hated New York Yankees, it was always fun to play against the Red Sox, It was a challenge but it was fun. As things stand at the moment, the Cleveland Indians hold a 2-0 lead against the Red Sox in the ALDS beating former Tigers Pitchers Rick Porcello and David Price. The series resumes Sunday at Fenway Park so the Red Sox have their hands full. Whether Butterfield gets another championship ring remains to be seen. But I have a gut feeling down the road that you'll see Brian Butterfield manage an MLB Club down the line. He's come close to landing a managers job so it appears to be inevitable as those jobs will open up this off-season. Nonetheless, it's great to reunite with another great person from the past and see that individual do well.